You will be given a reference e-book to read which has 238 pages And the test will be based on that e-book , you can take final test within 1 year of purchase. Animation is actually a term which is derived from the Latin words animare which means to breathe life into and anima which means life. It refers to a set of still drawings that are viewed by people in rapid succession to offer an impression of a moving picture. Animation also refers to the speedy display of a series of images in either 2D or 3D model positions or artwork with an aim of creating an illusion of movements. The results of animation can be defined as optical illusion of movements because of the vision persistence. It can be presented in a variety of ways including video programs and motion picture. But you cannot expect an animation to be striking without an amazing storyline. This means that learning the basics of animation writing is important in your attempt to become a successful animator. Most of the time, animators are also considered as the writer. Animation writing involves the process of creating a storyboard which can be defined as a series of sketches with a single panel that are pinned on a board. It is important for you to write action summaries or dialogues under each of the sketches so a good story will start to flow. You can rearrange the sketches many times to make sure that the entire story gets a proper flow but you have to discuss the arrangement with the director and the animator. To further hone your skills in writing the best storyline for animations, it is best if you enroll in an animation writing course. 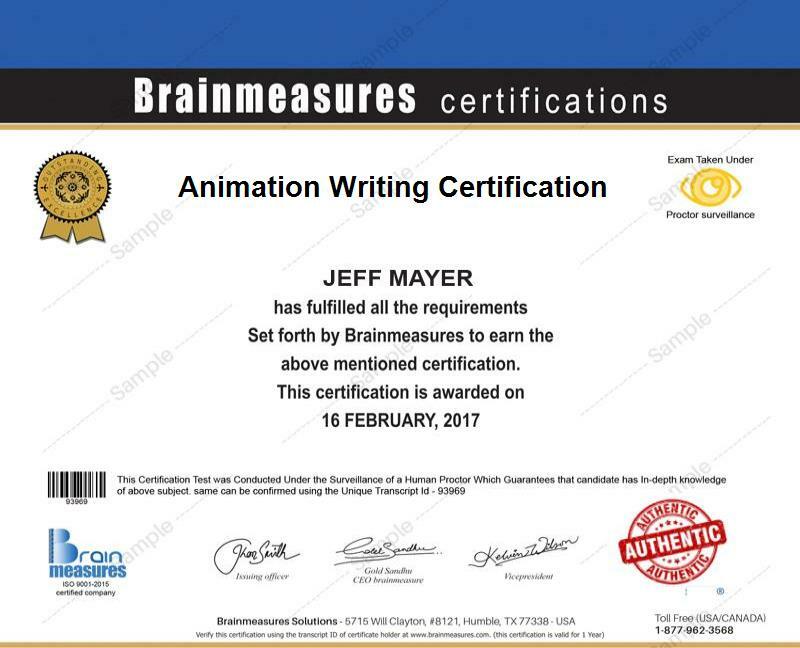 If you have a strong passion towards animation, then the animation writing certification program from Brainmeasures is highly recommended for you. This online certification course provides you with all the information that you need to become a successful and skilled animation writer. The animation writing certification course gives you the opportunity to learn all the elements and strategies linked to animation and writing the most captivating storyline for it. The program comes with an online writing exam which will test your knowledge and skills about animation and if whether you are already skillful enough to write stories for it. Passing the test and receiving your animation writing certificate are indications that your ability in writing animation stories is top-notch. The program also lets you understand all animation techniques including traditional animation, computer animation which includes both the 2D and 3D animation, paint on glass animation, sand animation, pin-screen animation, character animation and special effects animation. The animation writing certification course which you can access in Brainmeasures is capable of benefiting a wide array of individuals and professionals. These include students or amateurs who desire to become an expert in the field of animation and animation writing, professional writers who work in other fields of writing but want to move into a new writing career by starting to write games and animation books and stories and non-writer professionals who already have a small background about animation writing but want to improve their skills in order for them to turn into skilled animation scriptwriter and game stories writer. The animation industry is popular for being a booming industry so you have an assurance that you will earn decently after completing your animation writing certification course. If you work as a certified motion picture and video scriptwriter, then you can expect to earn around $98,000 per year. If you decide to work as a storyboard artist, then your annual salary can be expected to start from $42,000.